California Artist Dennis Ziemienski paints images of earlier times. 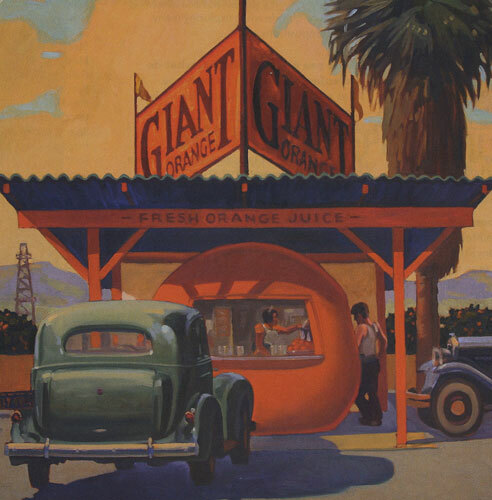 Dennis Ziemienski, Giant Orange, oil, 36"x36"
Dennis Ziemienski, Dubrow's Cafeteria, oil, 36"x48"
Collectors familiar with his paintings know that Ziemienski is fond of telling stories. He attributes his penchant for narrative in part to his days as a successful commercial artist in New York City, where he illustrated stories for Fortune, Reader’s Digest, Redbook, Rolling Stone, and National Lampoon magazines. In his illustration heyday, the award-winning artist also designed covers for books such as Elmore Leonard’s Freaky Deaky and Armistead Maupin’s Tales of the City. Like many artists, Ziemienski says his career began as a youngster, when he drew constantly. But his path to an art career took some detours along the way. During his senior year in high school, the Vietnam War was raging. His father, a nuclear engineer, suggested he join the Navy Reserve. “I became a weekend warrior,” Ziemienski says. It would be several years before he had to go on active duty, so he began attending classes at San Jose State University, studying commercial art and graphic design. Eventually, as part of his six-year Navy commitment, Ziemienski spent two years overseas, most of the time on a submarine going to places like Japan, Taiwan, Singapore and Vietnam. He recalls that at one point the sub he was on stayed submerged for 72 days without surfacing, mainly spying on the Russians, he says. During this time he also became the ship’s resident artist and drew what he saw through the periscope. 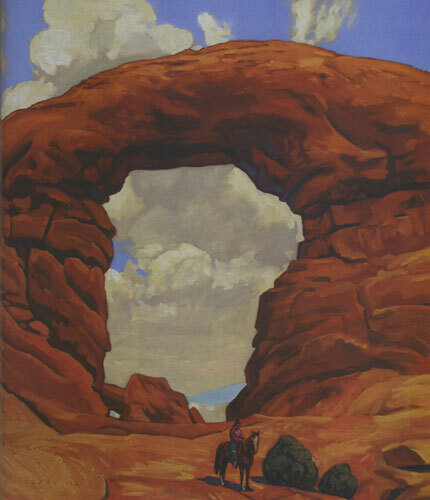 Dennis Ziemienski, Red Rock Rider, oil, 44"x40"
After his stint in illustration in New York, Ziemienski returned to his native Bay Area in 1990 and began focusing on a fine-art career. Today, he lives with his wife, Anne, who is a mosaic artist and designer, in the wine country north of San Francisco in a Sicilian-style farmhouse that he designed. 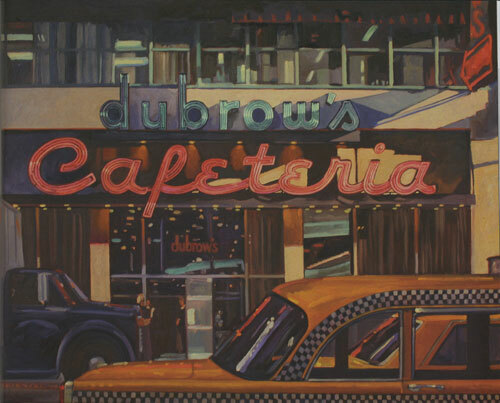 Mark Sublette, owner of Medicine Man Gallery in Santa Fe, NM, and Tucson, AZ, has represented the artist for the past five years and says that what drew him to Ziemienski’s paintings were his strong compositions and his ability to create scenes that tell a story. Sublette says he was also attracted to the time period Ziemienski portrays. 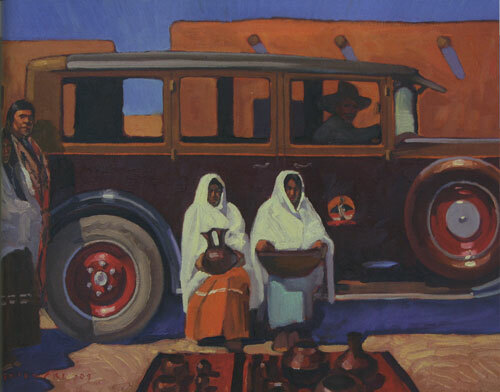 Ziemienski likes to refer to the time period in his oil paintings as “the Old West after the Old West.” Historians might call it the time when railroads, automobiles, motels and rodeos began to dominate the western scene at the beginning of the 20th century. While earlier cowboy and Indian scenes are quite common, Ziemienski’s era of choice hasn’t been as well documented. “You don’t see a lot of paintings of cowboys driving Model T Fords, but they did – and right alongside their horses,” he explains. While Ziemienski was working on the series (for Michael Hollis Fine Art in South Pasadena), a friend’s daughter was visiting at his farmhouse, and he watched her thoroughly relish eating an orange. He asked if she would consider posing for him. The result: Girl with Oranges. In another piece in the series, the artist rounded up his wife and some neighbors to simulate a turn-of-the-century orange harvest. 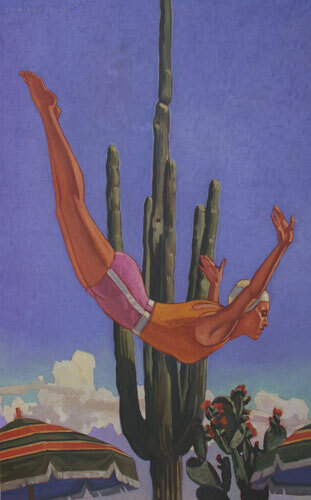 Dennis Ziemienski, Desert Plunge, 48"x36"
Much of his imagery portrays the period when the people from other parts of the country started traveling out west on vacations. “Companies like the Fred Harvey Company brought in tourists and took them on tours of pueblos and the countryside,” Ziemienski explains. All of this gradually led to the opening of a number of resorts, spas, and dude ranches in New Mexico, Arizona and California. In Desert Plunge, Ziemienski captures the era with a girl in a swim cap and bathing suit springing off of a diving board at what easily might be one of these desert getaways. Dennis Ziemienski, Runningboard Sale, oil, 18"x24"
Dennis Ziemienski, View Near the Rooftop, oil, 48"x24"
Ziemienski’s main goal, he says, is to offer viewers a chance to imagine “the way things might have looked in the past – to create a sense of history.” He can only speculate on why more artists haven’t chosen to capture this era. The abstract movement in art was beginning around 1920, and, with the exception of painters like Maynard Dixon and Ernest Blumenschein, many artists may have favored abstraction, he theorizes. And later, in the ‘50s and ‘60s, movements like pop art sprung up to command the attention of the art world. Bonnie Gangelhoff is the senior editor at Southwest Art.